You know that anxiety nightmare where you have to do a public speech completely unprepared, and everybody laughs? Imagine that being your actual reality. Except you are at the UN rather than at your brother’s wedding, with world leaders chuckling away at your bluster and pomposity. This is the scenario which faced US President Donald Trump during his address to the United Nations General Assembly, on September 25. In less than two years, my administration has accomplished almost more than any other administration in the history of our country. Now, this is a bold statement when you consider Trump is the 45th President of the United States, following in the footsteps of historical figures such as Abraham Lincoln, Theodore Roosevelt and John F Kennedy. A little humility would have been nice. The delegates evidently found this brag to be hysterical, and audible laughter could be heard ringing throughout the hall. President Trump appeared surprised at his own accidental comedy, responding, ‘It’s so true… didn’t expect that reaction but that’s okay’. Unfortunately, this only prompted further giggles. Undeterred by the incredulous laughter, President Trump proceeded to describe the US as being ‘stronger, safer and richer country than when I took office’. We are standing up for America and the American people and we are also standing up for the world. This is great news for our citizens and for peace loving people everywhere. Meanwhile, Americans and non-Americans alike have been taking to Twitter to discuss the facepalm-worthy moment. 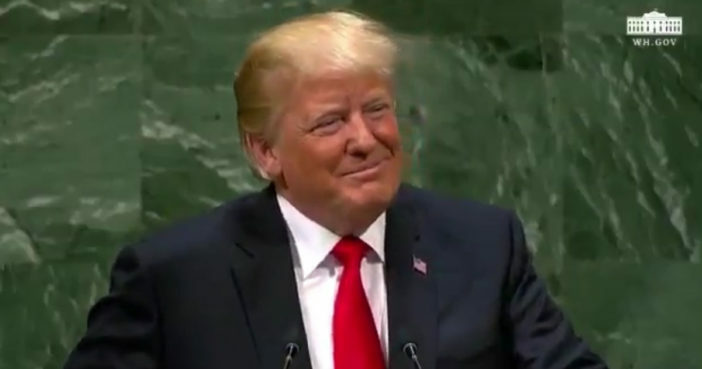 Members of the UN are openly laughing at Donald Trump. I wish we could add the Seinfeld laugh track to this speech. What a complete moron that sits in the oval office. Congrats on your speech to the UN. You’ve said before that the world was laughing at us. You’ve managed to get them to laugh at us right to your face! Quite an accomplishment, Mr. President! @realDonaldTrump Congrats on your speech to the UN. You've said before that the world was laughing at us. You've managed to get them to laugh at us right to your face! Quite an accomplishment, Mr. President! Watching Donald’s Trump speech at the UN general assembly truly made me laugh. During his UN speech this morning, world leaders laugh when Donald Trump said his administration accomplished more than others. Now he’ll claim he’s the best stand-up ever. Those with a good knowledge of Trump’s Twitter history were reminded of a tweet made way back in 2014, when his dreams of The White House were still yet to be realised. We need a President who isn’t a laughing stock to the entire World. We need a truly great leader, a genius at strategy and winning. Respect! President Trump did not get off to the best start even before taking to the mic. As reported by Quartz, he showed up late to UN headquarters and missed his original speaking spot. Tradition dictates the US president should be the second speaker at the UN General Assembly but this was not to be. Ecuador’s president Lenín Moreno Garcés took Trump’s place instead, with the US president taking to the podium over half an hour after his speech had originally been scheduled. Great stuff.